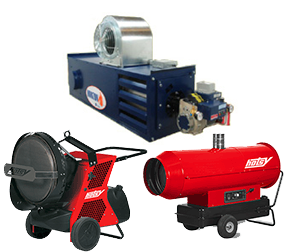 PSI Equipment offers several heating solutions for the winter months. For construction or utility professionals working outdoors, Hotsy’s new line of portable radiant and indirect space heaters are durable, and highly efficient. Typical forced air heaters lose their heat because hot air rises, or the wind redirects the hot air stream. Radiant heat travels in straight lines and does not rise to the ceiling like hot air. These are the perfect way to heat work areas where you may already be cleaning with a pressure washer. Others include wash bays, garages, curing concrete, heating new construction, heating sewers for work crews – even warming animal pens. Approved for construction, the RedHot Cannon is available in three models, the 100, 200 or 300 with a run time of 13 to 14 hours. These radiant heaters use kerosene, diesel or jet fuel and have a low noise level. Our line of waste oil heaters taps into the energy within used oil and uses it as a money-saving fuel supply. There’s no need to pay high fees to haul waste oil away when you can dispose of it on site, and use it as a secondary heating source to heat your facility. Waste oil heaters are easy to install and offer user-friendly maintenance. Models are equipped with either a single or triple pass heater with a swing out burner for easy chamber access for cleaning. Used oil heaters are thermostatically controlled with a flame sensor and cut off controls, the patented burner design offers a slide-out gun assembly with quick disconnects for the electrical connection. Based in Springdale, we provide heating solutions for Arkansas. To learn more, give us a call for a quote.